Koldfront 24 Bottle Free Standing Dual Zone Wine Cooler (March 2019) Review! Koldfront 24 Bottle Dual Zone wine cooler is perfect for those looking to get a compact sized cooler which doesn’t take up much space. You can store up to 24 standard sized bottles in this one. There are total 8 shelves which are divided into two zones. The top zone consists of four shelves which can hold up to 12 bottles. The temperature range on top zone is 54F to 66F. The lower zone consists of same amount of shelves and can hold same amount of bottles as the top zone. The temperature range on the lower zone is 46F to 66F. There is a safety lock available at the bottom, it comes in handy if you need to make sure no one other than you accesses your collection. The outer body is made of up stainless steel, the cabinet color is black which looks sleek. The exterior dimensions are 33.5″ H x 14″ W x 22.25″, the door is designed to open from left to right on the outside. It is important to note that because in some structures it is not viable for you to open the door easily. The interior has a nice soft LED lighting which looks good and is not intrusive. The wooden shelves are easily removable and you may be required to remove them completely every time you need to place the bottle again. Overall we rate this product 4.5/5 due to it’s quality features and high amount of positive customer reviews. Also the price is quite reasonable compared to the other products in the same range. You can check some of the customer reviews from Amazon.com right here. 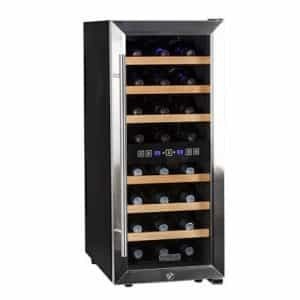 You can also check other wine cooler reviews featured on this website by visiting this list of 10 best wine refrigerators reviews. We also recommend personally that you check out our review of Avanti 12 Bottle Thermoelectric Counter Top Wine Cooler – Model EWC1201 Review if you’re looking for a smaller wine cooler. If you’re looking for a wine cellar that can handle more bottles then this product then make sure you check this Allavino FlexCount VSWR36-2BWFN Black 36 Bottle Dual Zone Wine Cooler Review.